One of the things I absolutely love about being a beauty blogger is when I get to discover new products ranges that I would almost certainly never stumble across otherwise. Shan Rahimkhan’s range of luxury haircare is one such range. Recently launched in Harvey Nichols the products are all designed to deliver volume and moisture to fine hair – an oddly difficult combination to find, as many volumising products are also quite drying on the hair (many contain salt). As someone with hair that manages to be both flat and dry, the premise of this range really appealed to me from the start. 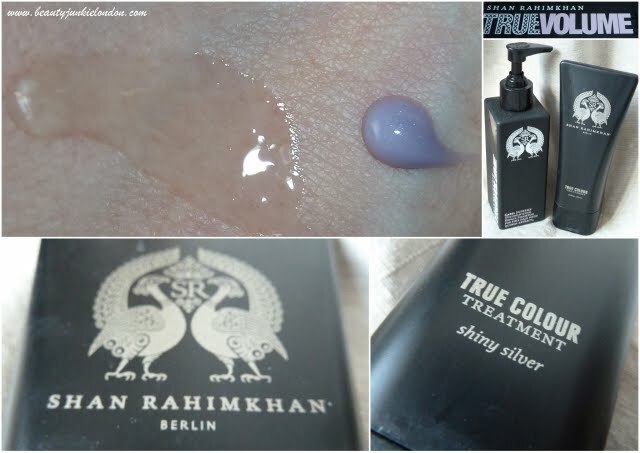 The Shan Rahimkhan products are completely free from all the parabens and sulphates – culprits that can often leave residue and weigh the hair down. Key natural ingredients in the products include: Bamboo, Tamanou Oil, Quinoa, Argan Oil and Aloe Vera juice. Having now had a decent amount of time to try out a couple of the products (the Supreme Volumising Shampoo and the True Colour Shiny Silver Treatment) I can now share my views. The True Colou Shiny Silver Treatment is truly amazing. I’ve used this about 6 times so far and every time I am amazed by the difference it makes to my hair. It’s make’s is so shiny and healthy looking! Plus it doesn’t hurt that after use I had a couple of comments about how shiny my hair was… (nothing like a compliment to cement my love for a product). The only downside is that I can’t use this with every was as it is quite an intense treatment, so I am combining the other shampoo with other conditioners. I also don’t want to use it too often as a bottle costs £31 so want to make it last! So I suspect this may mean that the results I am getting aren’t as reflective of the range as it is a ‘system’ of hair care that is designed to be used together. That being said, the shampoo really does give hair healthy volume whilst keeping it soft and smooth. The volume is natural – so you can’t expect Bardot-style big hair – but it makes my fine hair look less ‘blah’. I do still tend to use some hair spray or mousse when styling to give it an extra boost, but when left to dry naturally the hair doesn’t just lie like a flat pancake against my head, it looks like it has some life in it – which is quite nice for a change. The shampoo costs £22.50 and the Shiny Silver (also available in gold) costs £31, both available from Harvey Nichols online and in store. The range also includes hairspray, wax, control/styling sprays and leave in conditioners. All tailored to suit different needs of fine hair (so if you have fine hair that is also coloured you don’t need to sacrifice your colour for volume and vice versa). To find out more about Shan Rahimkhan you can visit Shan’s website or for info on the range go to Harvey Nick’s website. Products provided as PR samples. Thanks for the info. Looks like nice products to try.